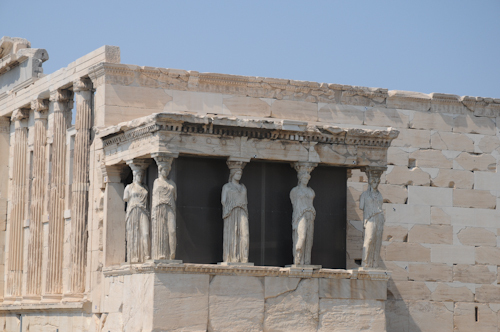 Athens, A Whirlwind Sightseeing Extravaganza! 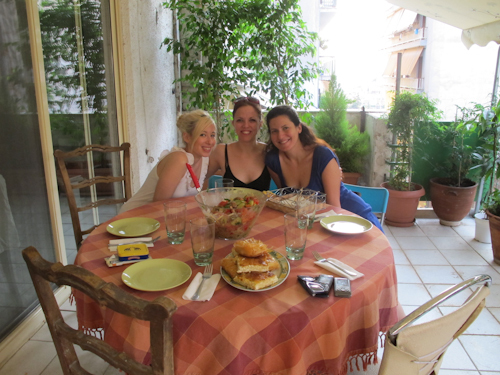 My two days in Athens were a whirlwind of sightseeing, eating and socializing with new friends. It was over before it had a chance to really begin! I had made lists of restaurants and food items that I really wanted to explore but did not make much of a dent at all in those lists! Having arrived so late on Friday night, I was really incredibly exhausted and just stayed in and chatted with my hostess from Athens, Eleni. She was so gracious and welcomed me with open arms and showed me how to work all of the important things in her apartment- such as the lights and the front door. I showered and fell into bed. I awoke early on Saturday and visited the Synagogue Beth Shalom. Services were followed by a lovely meal at the Chabad of Athens. I really enjoy learning about how Jews around the world live and maintain communities in areas where it is often difficult to sustain such a community. Especially when things such as kosher meats are not available and must be shipped in at very high costs. I am truly lucky to live in NY where everything you want to find, kosher or not is very easy! They were incredibly gracious hosts and I was so happy to meet two other ladies who lead very interesting lives and we all discussed the various adventures we are on. One of them had recently traveled to Florence for a culinary vacation and spoke very highly of the place she attended. Seems there may be an addition to my ever growing list of places to visit! Back at the apartment, Eleni, made a beautiful cheese pie (she said it was her first time, but it was perfect and I would never had guessed that it was a new recipe!). Two of her friends had come over for an impromptu dinner, and were busily making salad and slicing fruit. They insisted that I join them and I am so glad I did! We ate salad and pie followed by a full fat frozen yogurt with caramel sauce and a sweet yellow melon. It was the perfect dinner and so nice just to sit on the terrace, have dinner and chat. Because the sun sets so late in the evening, Eleni suggested that I go and visit the Parliament building to see the changing of the guard. 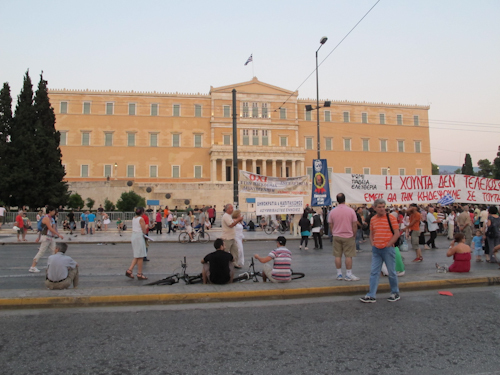 The Parliament of Greece has been the scene of several protests and even some violence in recent days, but for the majority, it has been rather peaceful if not very noisy. Syntagma Square lies at the foot of Parliament and is currently occupied by a “tent city” reminiscent of Tompkins Square Park in NYC in the late 1980’s or the” sit ins” we’ve seen on TV from the late 60’s and early 70’s. There are several street vendors selling their wares as well as food carts with nuts and gyros set up throughout the park. And of course, there are the protestors, a mix of old and young Greeks holding signs and flags, chanting their slogans. 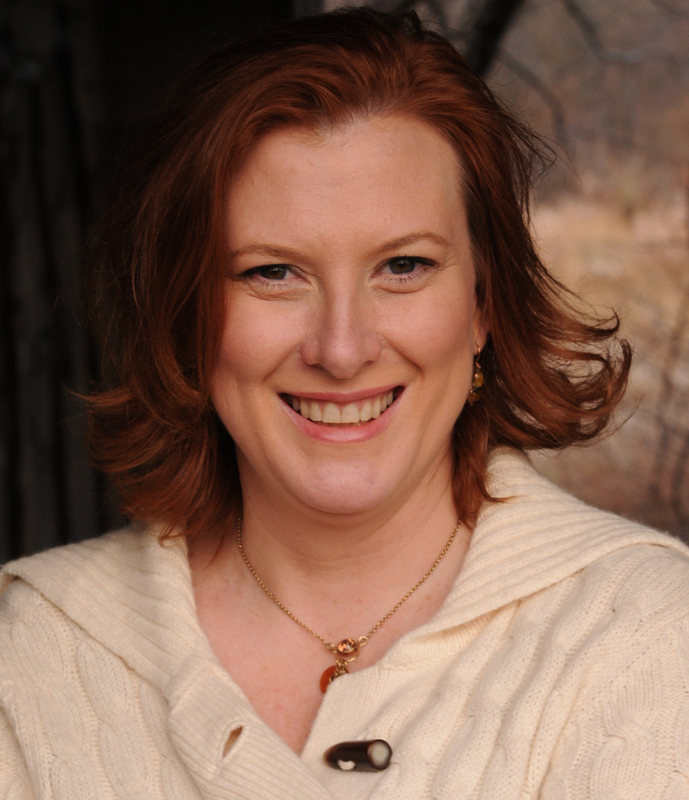 There is more of a commune vibe there than a violent one. You can see all the pomp and circumstance of the changing of the guards, called Evzones, in their traditional garb, which occurs on the hour, every hour of each day. I advise bringing a large zoom lens if you intend to take pictures there because of the layers of security between the crowd and the guards. There are two rows of barricades set up and a row of riot police and a row of Greek Army guards. They were quite accommodating to the tourists that were there moving around to allow them to photograph the changing procession. It’s best to go in the early morning since most of the protestors show up in the late afternoon and stay through the evening. I only had my small camera with me at the time but I was able to return on Sunday to take proper photos where you could see actually see the guards. One of the guards noticed I was snapping photos of them, rather than the protestors, and shot me a quick smile which made my day. I felt badly for them having to “perform” with all the chaos going on around the square. Strolling down to the Plaka, you can window shop along the long pedestrian road but they have many of the same chain stores that we have in the US; Sephora, Zara etc. It is all very touristy. But if you continue past there, you can view the Acropolis which can be seen from several spots below in all it’s glory, lit up at night. I stopped at a café for some coffee and then continued my night wanderings ending up in the neighborhood just south of the Acropolis. Even though I was wandering very dark streets at well past 11pm, I felt perfectly safe and no one looked very suspicious at all. I even returned home on the Metro and it was crowded with Greek youths on their way out to the clubs and bars. I was told that there isn’t so much violent crime as there are petty crimes, like robbery etc. Sunday morning I awoke rather late (jetlagged still!) and visited the New Acropolis Museum. Inaugurated in the summer of 2009, it is located just 300 meters south of the Acropolis. During the excavation of the museum, an ancient Athenian city was unearthed and the museum installed large glass floors and more than 100 concrete pillars to raise the museum so that the archaeological excavation could continue. 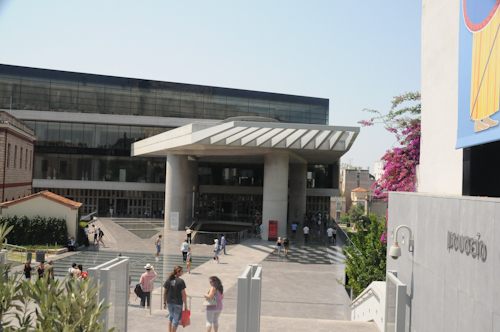 The museum is a beautiful example of modern architecture with stunning views of the Acropolis. 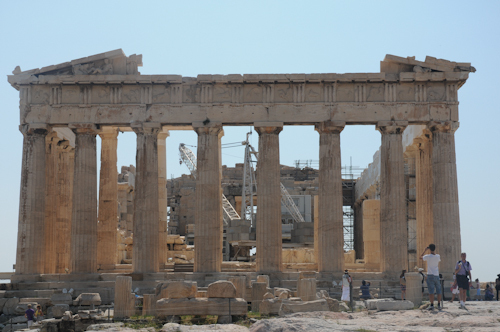 The galleries hold many of the Parthenon sculptures, including a specifically designed concrete core in the same dimensions and orientation as the Parthenon itself that will house the entire temple frieze. I say “will” because it seems that there are still over 2/3 of the sculptures that were removed in 1799 by the seventh Earl of Elgin and taken to England. Many were sold to the British Museum which refuses to return them to Greece. At least for now! You can also see finds from everyday Athenian life throughout all of the historic periods throughout the museum. I was fascinated with the ingenuity of a 6” doll that was made of marble from the mid 6th Century B.C. that had moveable arms and legs. Also, during the Archaic period, the early Greeks affixed small discs (called meniscoi) on the heads of statues to protect them from bird droppings. Even then, the pigeons were a nuisance! Some of the best parts of the museum are the sculptures. You can still see where the hair of the women has been dyed. There is also a terrific short video that gives an excellent overview of the building of the Acropolis with several fascinating details about it’s optical illusions. For lunch, the New Acropolis Museum has an excellent restaurant where you can find salads (5-6 Euros), sandwiches (Turkey, Salami or Feta) (4 Euros),and specialty dishes such as Veal with eggplant and mashed potatoes from Thessaloniki for 12 Euros. They even have full kids’ meals of pasta with sauce or meatballs and french-fries with milk and a biscuit for just 6 Euros. Of course there is a wide selection of wine by the bottle and by the glass (3.5 Euros), as well as bottles of beer from around the world. This is a real bargain considering a Diet Coke (Coke Light) is 2.20 Euros for a very small bottle. Better to have wine! Desserts range from 5-6 Euros and you can choose from something light like Lemon Mousse or Yoghurt Ice Cream with Sweet Preserves to Walnut Cake with Mastilha Ice Cream. 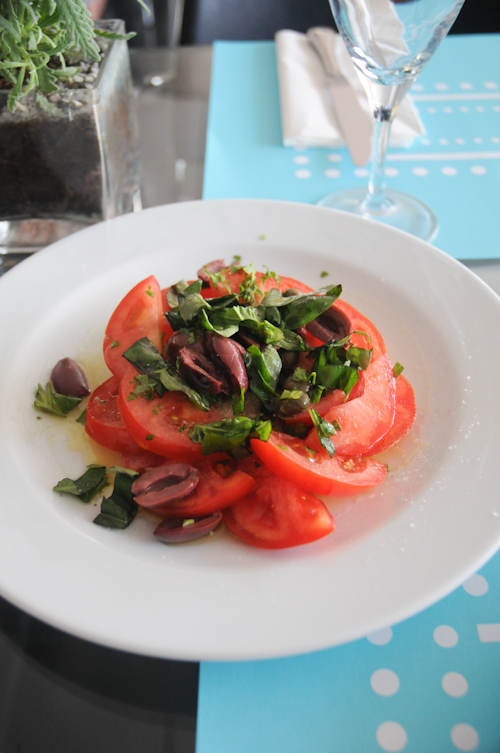 I really enjoyed the Tomato salad with Capers, Basil and Dakos from Crete. Dakos is often called “Greek bruschetta”. It’s a very hard bread made from twice baked rusks of either whole wheat or barley flour. Because it is so hard, it’s placed to soak up the olive oil underneath the salad and broken up once it has become less hurtful to your teeth. This salad was so simple yet so satisfying. 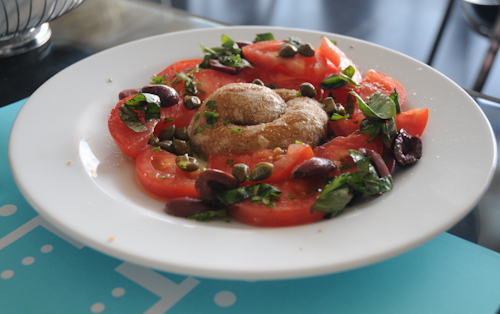 Consisting of just tomatoes, capers, fresh basil, olives, oil and a touch of salt and pepper, it can easily be recreated at home. I also tried the Meatballs with Mint which was served with a dry garlicky yogurt sauce but I would avoid these as they seemed as though they were coated with a batter and baked until quite dry and crumbly. Although the presentation was pretty, they were quite flavorless and would have been better if they had been fried and left with some fat in them. 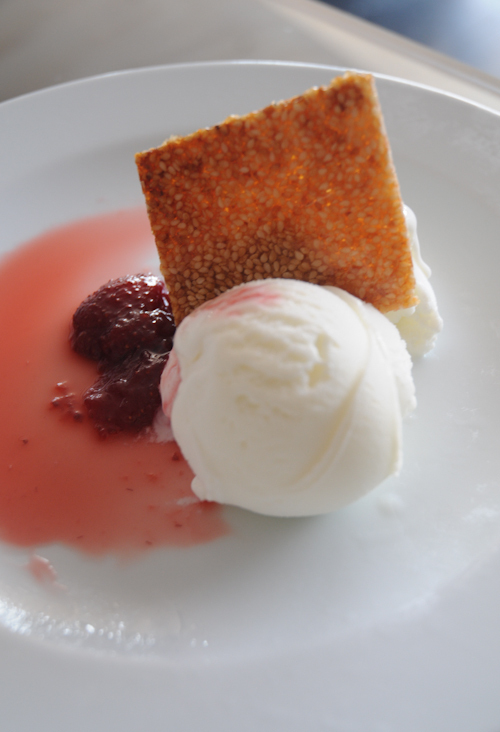 For dessert, the Vanilla yogurt ice cream with the sweet strawberry preserves hit the spot. Cool, refreshing and a sweet treat. You really cannot go wrong with ice creams when it’s 90 degrees F. out! Thinking that I had escaped the hottest part of the day by 3pm, I made my way to the Acropolis to visit the Parthenon. I was mistaken! The temperature must have been near 100 degrees at the top and the sun just bore down on you. I really wished I had brought a hat. In spite of the heat and the sun, I am so happy to have seen the Parthenon. It’s really an incredible feat of architecture and perseverance when you think of it. Built in just 9 years and made of 16,500 pieces of marble, the architects took into consideration how it would look visually and purposely, gradually sloped the sides from the center downwards while making the corner columns wider. 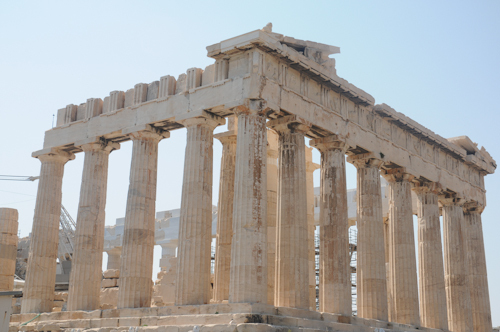 The Parthenon was also destroyed several times though the centuries and had been both a mosque and a church. 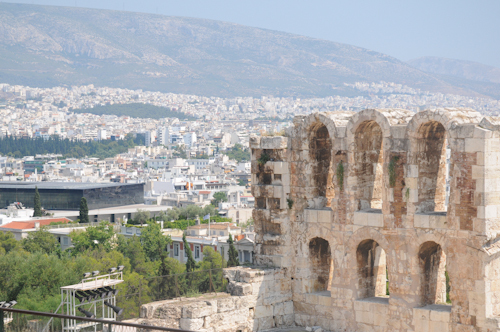 The other monuments on the hill include the Herodes Atticus Theatre which is still used today for musical productions, plays and stage performances. It would be wonderful to be able to see a production there, sitting in the warm outside air surrounded by ancient beauty. 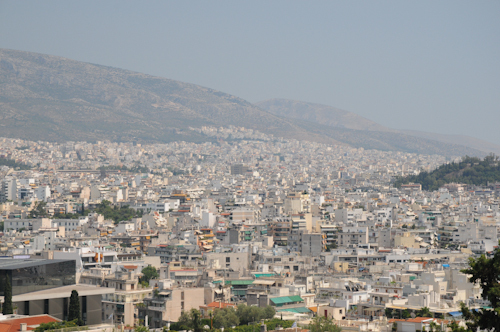 In addition to these beautiful sights, the panoramic view of Athens is incredible. You don’t realize just how large the city is and how densely populated until you see it from above. The entire way around the Acropolis is just like this! For just 12 Euros, your ticket to the Acropolis also includes entrance to several other sites such as the Ancient Agora, the Archaeological Museum of Kerameikos and Kerameikos itself, the Museum of the Ancient Agora,the North slope of Acropolis, Olympieio, the Roman Agora of Athens and the South Slope of Acropolis. It is well worth the price and the ticket can be used over several days, as it is a lot to take in all at once. I made it only to two of the additional sites before I threw in the towel for the day. 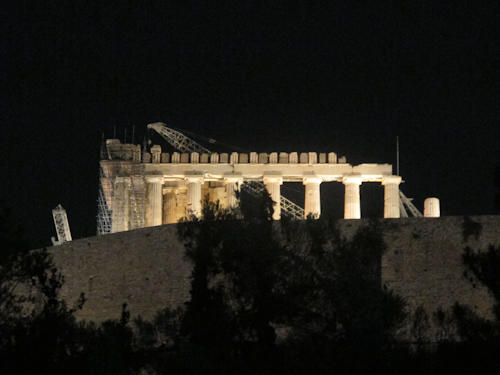 So, while I did not see nearly all of the things I wanted to, I did see quite a bit and I’m thrilled that I even had the opportunity to see as much as I did, and to meet so many wonderful people during my stay in Athens. I will have one night left in Athens after Kea. I am staying in a hotel near the Plaka because I heard that the restaurant was quite good there, so I am excited to try at least one that is on my list! Travel Tip #1- Bring a roll of toilet paper with you in your bag, or have tissues readily available. Not all bathrooms at sightseeing destinations have toilet paper. Travel Tip #2- A hat and sunscreen are incredibly important when visiting sights on tops of mountains. Also, bringing your own water bottles and snacks will save you many Euros at the top if you should become thirsty or hungry!